Ten of our club sailors are part of the IODAI U12 Irish squad that travel to Pwllheli this coming weekend to compete at the British Optimist Nationals. There are 22 sailors on the squad from around the country. It is the second year as part of the U12 squad for Aoife Byrne, Rob Keal, Killian O’Regan and Conor Walsh. They are joined this year by Conor Aherne, Cillian Foster, James Hassett, Ben O’Hare, Rory O’Sullivan and Harry Twomey (pictured above last March). The sailors are travelling this weekend with their families to Pwllheli, Wales which is hosting the Optimist Europeans this week. They will be coached by Thomas Chaix, Dara O’Shea and Jil McGinley. Racing commences on Sunday through Friday 31st July. 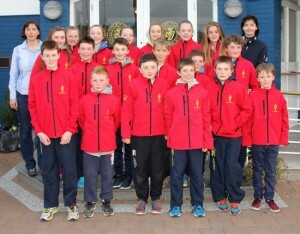 There are also siblings/other sailors travelling from the Club to compete and we wish them all the very best of luck.